New Interschool Chess Champions Harrison College Receive Their Crown – Barbados Olympic Association Inc. 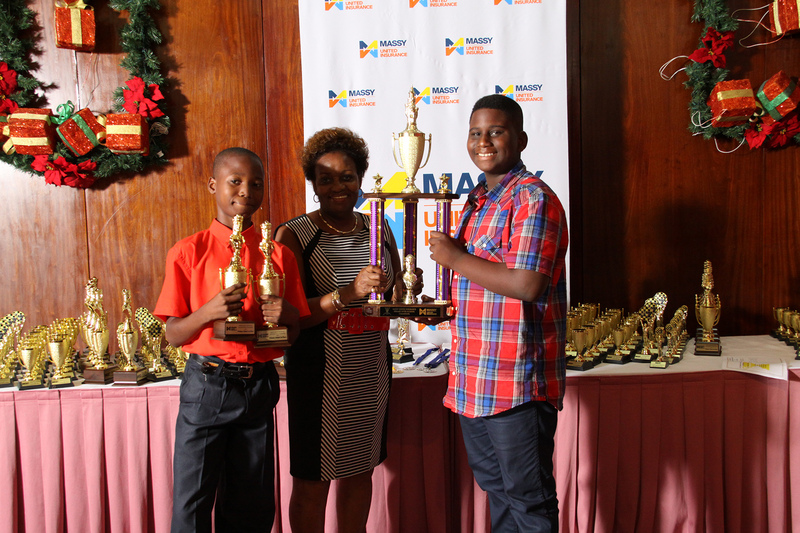 The Barbados Chess Federation (BCF) held its annual prize giving for the 2015 Massy United Insurance Interschool prize giving ceremony at the Central Bank, Grande Salle last week where trophies were presented for outstanding performances during the said tournament. At the end of the night it was Harrison College who raised the trophy as the overall secondary schools champion while Milton Lynch were the primary school champions. The ‘Kolij’ were extremely proud to dethrone perennial power house, the Lodge school. Beyond the receiving of prizes, students and parents were treated to speeches from the sponsor’s representative Mr. Dwight Lashley and a feature address from Mrs. Faith Marshall – Harris. Mrs. Marshall – Harris, a former magistrate and currently a UNICEF children’s champion spoke glowingly on the benefits of playing chess and noted that playing a sport as well as partaking in a cultural activity were one of the rights of a child. She was also quite impressed to see so many children partaking in the sport and the overwhelming support of their parents, reflected by the large numbers present at the awards ceremony. In the secondary section which is played in three sections, the Under 13, Under 15 and Under 20, Harrison College were the most consistent of the schools and deservedly won the overall title. In the Under 13 section, Queen’s College led by Shane Skinner was first, Harrison College “A” second and Harrison College “B” third. In the Under 15 section, Harrison College led by Kyle Sandiford on top board was first, with Queen’s College in second, the Lodge School in third and St. Leonard’s Boys “A” in fourth. In the Under 20 section, the Lodge school was first, Harrison College finished in second and Combermere in third. The Primary School section was won by Milton Lynch “A” led by Dominic Brathwaite on top board, Charles F Broome “B” were second followed by their C team in third, while St. Cyprian’s Preparatory Boys’ School “C” team were fourth. The Girls’ trophy went to Queen’s College led by Segan Sandiford, with Charles F Broome in second and Harrison College in third. It would be hoped that after seeing the smiles of the students’ faces, Massy United Insurance would continue their sponsorship in the year of 2016, as the BCF continues in its endeavor to create a nation of critical thinkers, a necessary consequence of playing chess. The BCF annual general meeting takes place on Sunday, December 20th at 4.30 p.m. at the Bridgetown Chess Center.